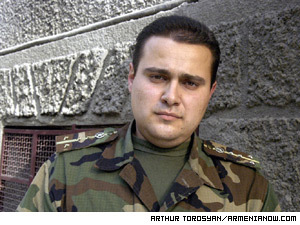 The Armenian officer who was with Gurgen Margaryan in Budapest has described the night that ended with his friend's murder. If you live in Armenia , have a big family, have no job nor any hope for a better future, you at least stand a chance to win a car from any of six lottery games. If you live on the outskirts of Yerevan or in a rural area or have just returned from Russia , where you were seeking for job without success, then your chances are even doubled. In two bright halls of Martiros Saryan's house-museum, 124 of the artist's portraits have gone on exhibition to commemorate his 124 th anniversary. The exhibition, called Time and Contemporaries, displays Saryan's work from different periods. It opened this week and will run for two months. Those who visit Ferik village in Armavir region must necessarily sojourn at Khdr Dukoyan's house. Khdr's family is not big. It consists of his mother, wife and three children which is quite strange for Yezidis who are used to having many children. If conditions had been good I would have made a 'football team' but today it's very hard to maintain a family, says Khdr. On the stage of Yerevan Theatre half naked actors are performing a play from a time when convention did not allow women to show even the ankle. They are presenting a new interpretation of one of the classics of Russian literature, Alexander Griboyedov's Misfortune from Intelligence. The play has a special connection to Armenia because the author saw it staged for the first and last time in Yerevan in 1827, when it was acted by officers of the Russian garrison. Only me and the program are left, says Nazareth Liparityan from Lebanon , who has been living for the past five years in Ditsmayi village in the south of Karabakh's repopulated Kashatagh region. Gevorg from Syria is the only other Armenian from the Diaspora remaining here. He married in Kashatagh and is raising three children, but he too plans to leave Ditsmayi. The Armenian Men's table tennis team is among 86 teams participating in the 47 th World Table Tennis Team Championships in Doha , Qatar this week. The team of four players - David Sargsyan, Murad Asatryan, Mesrop Ghukasyan and Samvel Vardanyan - have won all of their group matches so far in the fourth division of the championships. They are in line to finish in 48 th place in the world. Coming Soon. New Armenian Church in Russian Capital. A new Armenian church will soon open in Moscow. During his visit to Moscow Catholicos of All Armenians Garegin II expressed his approval of the course of constructions.This is how Surb Khach (Saint Cross) church will look when completed.